Stone Age Ceramic Pots from Hunan Province, China. Among the Oldest art of its type. For more about ancient culture in Asia, see: Asian Art (from 38,000 BCE). Yuchanyan Cave in Hunan province, China, is home to some of the oldest Chinese pottery ever found. In 2009, a report in the Proceedings of the US National Academy of Sciences announced the discovery of a number of ceramic pot sherds at Yuchanyan, dating to 16,000 BCE, which ranks them amongst the oldest Stone Age art in Asia. China is now established as the birthplace of ancient pottery as well as the finest producer of porcelain and other ceramics. The Yangzi (or Yangtze) River basin, for instance, is home to both the world's oldest ceramic pots - the Xianrendong Cave Pottery (18,000 BCE) made in southeast China's Jiangxi province - and the second oldest pots at Yuchanyan. The next oldest ceramic art is the large cache of fragments of Vela Spila Cave Pottery (15,500 BCE), from Korcula Island off the coast of Croatia. After this comes the sherds of Japanese Jomon Pottery, unearthed at Odaiyamamoto I site, Aomori Prefecture, Japan, which date to 14,500 BCE (see Japanese Art) and the Amur River Basin Pottery (14,300 BCE). The oldest clay-fired sculpture remains the Venus of Dolni Vestonice (C.25,000 BCE), one of the Gravettian Venus Figurines made in the Czech Republic. To see how Yuchanyan pottery fits into the evolution of ancient art around the world, see: Prehistoric Art Timeline (from 2.5 million BCE). For the history of ancient cultures in East Asia, see Chinese Art Timeline (18,000 BCE - now). Although the cave was known to local inhabitants for many years, no evidence of prehistoric art had been found and excavations did not begin until the 1980s. A second series of investigations took place between 1993-1995, and between 2004-5, conducted by teams from the Hunan Provincial Institute of Cultural Heritage and Archeology. The latest excavations were performed in 2005 by a team of Chinese, Israeli, and American scholars, led by Elisabetta Boaretto. The floor of the cave measures roughly 12-15 meters (40-50 feet) by 6-8 meters (20-26 feet) covering an area of about 100 square meters. Boaretto's team focused their attention on very small-scale areas of the floor (about 2 square feet), meticulously collecting bone and charcoal fragments for dating purposes. They also found tools made from bone and shells, as well as sherds from at least two ceramic vessels indicating that the cave was used by Late Paleolithic hunter-gatherers. Analysis of these floor deposits showed that the cave was occupied by humans between 19,000 and 11,800 BCE, while the age of the ancient pottery was calculated between 16,300 and 13,430 BCE. This makes Yuchanyan's pottery the earliest art of its type after the Xianrendong pots. Boaretto's team used a total of 40 radiocarbon-dated samples to support its conclusions. These results have since been reinforced by radiocarbon dating at Xianrendong Cave in Jiangxi, although at least one Chinese anthropologist has warned that the accuracy of radiocarbon dates in Hunan's karst area have been under debate for many years. Whether the discoveries of Paleolithic art at Xianrendong and Yuchanyan will end the debate in the archeological community as to whether pottery was first made in China or Japan, is not yet clear. Archeologists unearthed fragments from at least two pots. One was only partially made. The sherds analyzed were thick (up to 2 cm), with a loose and sandy texture, and coarsely pasted. Kaolinite was a major constituent. They were dark brown in colour and decorated with cord-marks on their inside and outside surfaces. The pots were hand-made and low-fired at about 450 degrees Celsius. 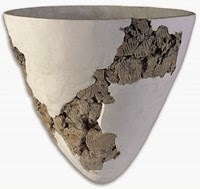 Enough sherds were found for researchers to reconstruct a large, wide mouthed vessel (approximately 31 cm (1 foot) in diameter and 29 cm (1 foot) high) with a pointed bottom. Known as a Chinese "fu cauldron", it is similar in appearance to Japanese pottery of the Incipient Jomon style (c.14,500-9,800 BCE). To see how Yuchanyan pottery fits into the evolution of ceramic art around the world, see: Pottery Timeline (26,000 BCE-1900). For a comparison with the finest ceramic pottery in Europe, please see: Greek Pottery (from 3000 BCE).